Inspiration struck for GiGi's 11 month onesie for my onesie project. She hasn't quite hit 11 months yet so I haven't done her pictures but since the 4th is coming up, I thought I should post the project a little early in case you're looking for a little inspiration yourself! This is another one of my raw edge projects so I intentionally left the raw edges of the fabric out so that it would fray and soften up in the wash. I put this on a onesie for G but you could easily apply this same idea to a kid's or even an adult t-shirt by adjusting the size. Check out how I put together this adorable American flag onesie! To fit on my onesie, I cut my flag pieces 4"x6". I cut one piece of lightweight fusible web, one of my white fabric and one of the red fabric. I ironed the fusible web to the back of the white fabric. Step 2: Sew the "stripes"
I cut a small scrap of blue fabric 2.5"x2" If you've read about my other onesie project posts, you'll know that I've tried to use scrap fabric for all of my projects. This time I really wanted a blue fabric with stars so I indulged on a $1 fat quarter for this one. Sew the blue scrap in the corner of the flag using a 1/8" seam allowance. Using a small sharp pair of scissors, cut between your sewn stripes to reveal the white fabric underneath . Snip the fabric vertically as close to the seam as you can every 1/4" or so to create a fringe affect. Do the same around the blue fabric. Don't snip the out edges quite yet. Center the flag and place it about 2" below the neckline. 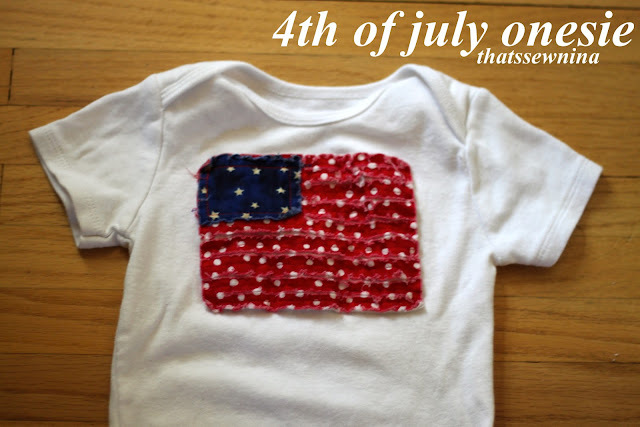 Pin the flag in place and sew it to the onesie along all four sides. Fringe the seam along the outside edge. Wash and dry the onesie once or twice and you you'll start to see the stripes reveal themselves more and more. Check the flag out after you've washed it the first time and see if there are any areas you want to trim up and fringe again if the white isn't showing through. That's pretty much it! Adorable! GENIUS! If I was at home with my sewing machine, I'd be making one of these tonight! Love it!